Desiderius Erasmus Roterodamus (also Desiderius Erasmus of Rotterdam) (October 27, c. 1466 – July 12, 1536) was a Dutch humanist and theologian. Erasmus deeply influenced Christian theology during the first half of the sixteenth century. Although not a Protestant, he contributed to the intellectual foundations of the Reformation. In particular, Erasmus encouraged the development of an “inner religion” in every person through the study of the New Testament. He produced the first Greek New Testament in 1516, making the original text directly accessible to theologians. His Enchiridion Militis Christiani, the Handbook of the Christian Soldier (1503), a guide to the New Testament for lay men and women, which suggested that the church could be renewed and reformed by a collective return to the writings of the Church Fathers and Scripture, went through twenty-three editions in six years. Erasmus attacked many abuses committed by the Church, but was unsympathetic to the Reformation and remained all his life within the Roman Catholic Church. Erasmus was finally brought into open conflict with Martin Luther and attacked his position on predestination; it is an irony that, after his death, his works were placed on the Roman Catholic Index of Prohibited Books by the Council of Trent. Erasmus lived his entire life as an independent scholar, unhindered by any connection that might interfere with his freedom of intellect and literary expression. He was offered many academic positions, but declined them all, preferring to maintain his independence. For many years, he worked as an editor for the publisher Froben in Basel, Switzerland. Erasmus’ influence was exercised through his personal contacts, his editions of classical authors, and his own writings. He was acquainted with most of the scholars of Europe, including the English intellectuals, Thomas More, John Colet, Thomas Linacre, and William Grocyn. Erasmus is still widely read today, because of his open-minded and rational approach to religion and daily life, and because of his satire and sense of humor. He was instrumental in introducing a higher stage in the development of the Christian’s relationship to God, in which people would relate directly and personally to God through their own free inquiry and study of Scripture, without the mediation of a priest or even the church. It was this inner religion that he prized, more than sacraments and religious rites. Born Gerrit Gerritszoon (Dutch for Gerhard Gerhardson) October 27, probably in 1466, most likely in Rotterdam, although recent discoveries suggest he was actually born in Gouda, the Netherlands. Although much associated with Rotterdam, he lived there for only four years and never returned. Information about his family and early life comes mainly from vague references in his writings. He was almost certainly illegitimate; his father was a priest named Roger Gerard and little is known of his mother other than that her name was Margaret and she was the daughter of a physician. He was cared for by his parents until their early deaths from the plague in 1483, and then given the best education available to a young man of his day in a series of monastic or semi-monastic schools. At about the age of twenty-five, he was admitted to the priesthood and took monastic vows, but never seems to have worked as a priest. Monasticism was one of the chief objects of his attacks on the evils of the Church. Erasmus went on to study at the University of Paris, then the chief seat of scholastic learning, but already under the influence of the revived classical culture of Italy. Erasmus chose to lead the life of an independent scholar, unhindered by national or academic ties, religious allegiance, or any other connection that might interfere with his freedom of intellectm and literary expression. The chief centers of his activity were Paris, Leuven, England, and Basel; yet he never belonged firmly in any one of these places. During his time in England, he made lifelong friendships with the leaders of English thought in the time of King Henry VIII; John Colet, Thomas More, Thomas Linacre, and William Grocyn. At the University of Cambridge, he was Lady Margaret's Professor of Divinity, and was given the option of spending the rest of his life as an English professor. He stayed at Queens' College, Cambridge, and may have been an alumnus. He was offered many positions of honor and profit throughout the academic world, but declined them all, preferring the uncertain but, as it proved, sufficient rewards of independent literary activity. He was in Italy from 1506 to 1509, and spent part of that time at the publishing house of Aldus Manutius in Venice, but apart from this he had a less active association with Italian scholars than might have been expected. His residence at Leuven exposed Erasmus to much petty criticism from those hostile to his principles of literary and religious progress. He represented this lack of sympathy as persecution, and sought refuge in Basel, where under the shelter of Swiss hospitality, he could express himself freely and where he was surrounded by devoted friends. Here he was associated for many years with the great publisher, Froben, and admirers came to him from all quarters of Europe. Erasmus's literary productivity began comparatively late in his life. Only after he had mastered Latin did he begin to express himself on major contemporary themes in literature and religion. His revolt against the forms of church life did not result from doubts about the truth of the traditional doctrine, nor from any hostility to the organization of the Church itself. Rather, he felt called upon to use his learning in clarifying the doctrine and in liberalizing of the institutions of Christianity. As a scholar, he tried to free the methods of scholarship from the rigidity and formalism of medieval tradition; but he was not satisfied with this. He saw himself as a preacher of righteousness. It was this lifelong conviction that guided Erasmus as he subjected the Catholic church to sound criticism, frankly and without fear. This conviction gave unity and consistency to a life which might otherwise seem full of contradictions. Erasmus held himself aloof from all entangling obligations, yet he was in a sense the center of the literary movement of his time. He corresponded with more than five hundred men of importance in the world of politics and of thought, and his advice on all kinds of subjects was eagerly sought, if not always followed. While in England, Erasmus began a systematic examination of manuscripts of the New Testament to prepare for a new edition and Latin translation. This edition was published by Froben of Basel in 1516, and became the basis of most of the scientific study of the Bible during the Reformation period (Bible Text, II., 2, § 1). In 1516, he published a critical edition of the Greek New Testament, Novum Instrumentum omne, diligenter ab Erasmo Rot. Recognitum et Emendatum. This edition used recently rediscovered additional manuscripts and included a Latin translation and annotations. In the second edition, the more familiar term Testamentum was used instead of Instrumentum. This edition was used by the translators of the King James Version of the Bible, and later became known as the Textus Receptus. Three more editions were published in 1522, 1527, and 1535. Erasmus dedicated his work to Pope Leo X as a patron of learning, and he regarded this work as his chief service to the cause of Christianity. Immediately afterwards he began the publication of his Paraphrases of the New Testament, a popular presentation of the contents of the several books. These, like all of his writings, were published in Latin, but were quickly translated into other languages, with his encouragement. Martin Luther's movement began in the year following the publication of the New Testament, and tested Erasmus's character. The issue between European society and the Roman Church had become so clear that few could escape the summons to join the debate. Erasmus, at the height of his literary fame, was inevitably called upon to take sides, but partisanship was foreign to his nature and his habits. In all his criticism of clerical follies and abuses, he had always protested that he was not attacking church institutions themselves and had no enmity toward churchmen. The world had laughed at his satire, but few had interfered with his activities. He believed that his work so far had commended itself to the best minds and also to the dominant powers in the religious world. As the popular response to Luther gathered momentum, the social disorders which Erasmus had anticipated began to appear. The Peasants' War, the Anabaptist disturbances in Germany and in the Low Countries, iconoclasm and radicalism everywhere, seemed to confirm his gloomy predictions. In spite of his aloofness from the debate, Erasmus was accused of having started the whole "tragedy." In Switzerland, his association with men who promoted extreme rationalistic doctrines especially exposed him to criticism. When the city of Basel was definitely and officially "reformed" in 1529, Erasmus gave up his residence there and settled in the imperial town of Freiburg im Breisgau, apparently finding it easier to maintain his neutrality under Roman Catholic than under Protestant conditions. His literary activity continued unabated, chiefly on the lines of religious and didactic composition. A major point of religious debate was the doctrine of the sacraments, and the observance of the Eucharist. Partly to clear himself of suspicion, in 1530 Erasmus published a new edition of the eleventh-century orthodox treatise of Algerus against the heretic Berengar of Tours. He added a dedication, affirming his belief in the reality of the body of Christ after consecration in the Eucharist, but admitted that the form in which this mystery ought to be expressed was a matter for debate. He declared that for the Christian public, it was enough that the Church should prescribe doctrine, and that speculation might safely be left to the philosophers. Erasmus proposed that a man may properly have two opinions on religious subjects, one for himself and his intimate friends and another for the public. The anti-sacramentarians, headed by Johannes Oecolampadius of Basel, quoted Erasmus as holding views similar to theirs; in his denial he betrayed how he had, in private conversation, gone a long way toward a rational view of the doctrine of the Eucharist. In 1535, after an absence of six years, Erasmus returned to Basel, where in the midst of the group of Protestant scholars who had long been his friends, and, so far as is known, without relations of any sort with the Roman Catholic Church, he died. During his lifetime he had never been called to account for his opinions by the dominant Church authorities; the attacks on him were made by private individuals and he had always been protected by men of the highest standing. After his death, his writings were placed on the Roman Catholic Index of Prohibited Books. Erasmus was unique in that he maintained his independence as a scholar and reformist, yet saw his writings widely accepted and kept the respect and support of many contemporary intellectuals. His most important work was as a critic of the Church and of contemporary social values, and as an editor of the works of the early Fathers of the Church and producer of the first Greek New Testament. Erasmus deeply influenced Christian theology during the first half of the sixteenth century. Although not a Protestant, he contributed to the intellectual foundations of the Reformation. He attacked many abuses committed by the Church, but was unsympathetic to the Reformation and remained all his life within the Roman Catholic Church. As a humanist he deplored the intolerance and cultural decline which characterized the religious warfare of the time. Erasmus’ original works were mainly satirical and critical, and written in Latin, the language of the sixteenth century scholar. His most important works were Adagia (1500, tr. Adages or Proverbs), a collection of quotations; Enchiridion militis christiani (1503, tr. Manual of the Christian Knight); Moriae encomium (1509, tr. The Praise of Folly, 1979); Institutio principis christiani (1515, tr. The Education of a Christian Prince, 1968); Colloquia (1516, tr. Colloquies); and his collected letters (tr., ed. by F. M. Nichols, 1904–18; repr. 1962). Erasmus’ best-known work, Praise of Folly (Latin: Moriae Encomium), dedicated to his friend, Sir Thomas More, was a powerful satire on both ecclesiastical and lay society and argued for a return to a form of Christian pietism. In 1536, he wrote De puritate ecclesiae christianae in which he tried to reconcile the different parties. Many of his writings appealed to a wide audience and dealt with matters of general human interest; Erasmus seems to have regarded these as a trifling leisure activity. As a result of his reformatory activities, Erasmus found himself at odds with both the Catholics and the Protestants. His last years were embittered by controversies with men toward whom he was sympathetic. Notable among these was Ulrich von Hutten, a brilliant, but erratic genius, who had thrown himself into the Lutheran cause and had declared that Erasmus, if he had a spark of honesty, would do the same. In his reply, Spongia adversus aspergines Hutteni (1523), Erasmus displayed his skill in semantics, accusing Hutten of having misinterpreted his utterances about reform and reiterating his determination never to take sides. The most important work of this last period was the Ecclesiastes or Gospel Preacher (Basel, 1535), in which he promoted the function of preaching as the most important office of the Christian priest, a Protestant emphasis. His little tract of 1533, Preparation for Death, emphasizes the importance of a good life as the essential condition of a happy death. The Education of a Christian Prince was published in 1516, after Erasmus’ time in Italy from 1506 to 1509, and twenty-six years before Machiavelli’s The Prince. Christian Gauss’s (1999) introduction to Machiavelli’s The Prince places its publication at about 1537, adding that it had been circulated in manuscript form, and plagiarized for many years. Lisa Jardin’s (1997) introduction to Erasmus’s work noted that Machiavelli set out to define princely duties as maintaining control by political force, saying it is safer to be feared than loved. Erasmus, on the other hand, preferred for the prince to be loved, and suggested that the prince needed a well-rounded education in order to govern justly and benevolently. Only then could the prince’s rule avoid becoming a source of oppression. We usually take the most care in reinforcing those shores most severely pounded by the waves. Now there are innumerable things which can distract a prince’s mind from its proper course… (the distractions include wealth, luxury and freedom) (Jardin, p. 11). …The man at the helm cannot be a sleepyhead … No sea ever has such severe storms as every kingdom constantly experiences. And the prince must therefore always be on his guard against going off course… (Jardin, p. 47). In addition to his works on religious reform, Erasmus undertook extensive scholarly projects such as the production of the first Greek New Testament, which allowed theologians direct access to the original text of the New Testament, and the production of reliable editions of patristic works, including the writings of Augustine. Initially Luther and Erasmus were on friendly terms, but their attacks on each other eventually created a break between Protestantism and humanism which persisted to the present time, in spite of Zwingli’s efforts at reconciliation during the 1520s. Erasmus was in sympathy with the main points in the Lutheran criticism of the Church. He had the greatest respect for Martin Luther personally, and Luther always spoke with admiration of Erasmus's superior learning. Luther hoped for his cooperation in a work which seemed only the natural outcome of his own. In their early correspondence Luther expressed boundless admiration for all Erasmus had done in the cause of a sound and reasonable Christianity, and urged him to join the Lutheran party. Erasmus declined to commit himself, arguing that to do so would endanger his position as a leader in the movement for pure scholarship which he regarded as his purpose in life. He insisted that only as an independent scholar could he hope to influence the reform of religion. When Erasmus hesitated to support him, Luther believed he was avoiding responsibility due either to cowardice or lack of purpose. Erasmus, however, was wary of any change in doctrine and believed that there was room within existing formulas for the kind of reform he valued most. Twice during their discussions, Erasmus allowed himself to enter the field of doctrinal controversy, a field foreign to both his nature and his previous practice. The discussion between Luther and Erasmus focused on the doctrine of the freedom of the will. Both Erasmus and Luther acknowledged that people had the psychological freedom to make conscious choices, but Erasmus believed that humans could consciously cooperate with God in accomplishing his own salvation, while Luther believed that salvation could be brought about only by faith and not by any human effort. In his De libero arbitrio diatribe sive collatio (1524), Erasmus analyzed with cleverness and good humor the Lutheran exaggeration of the obvious limitations on human freedom, laying down both sides of the argument impartially. He took the position that man was bound to sin, but had a right to the forgiving mercy of God if only he would seek this through the means offered him by the Church. The Diatribe did not encourage any definite action, a fault in the eyes of the Lutherans. In response, Luther wrote his De Servo Arbitrio (1525), attacking the Diatribe and going as far as claiming that Erasmus was not a Christian. Erasmus’ reluctance to take sides in the debate brought upon him the suspicion of disloyalty to Catholicism. Erasmus sought to use learning and reason to expose the worst excesses in religious doctrine and practice, and to initiate a regeneration in the moral and spiritual life of Europe which could only occur over a period of time. Erasmus did not attempt direct reform of the existing church system. When Erasmus was charged with having "laid the egg that Luther hatched," he half admitted the truth of the charge, but said he had expected quite another kind of a bird. Erasmus was a Christian humanist, and in this sense, believed himself to be a better Christian than any pope of his time. However, Luther was critical of Erasmus’ detached scholarly attitude toward the contents of the Christian faith. Erasmus was a skeptic; Luther believed in making absolute statements on matters of ultimate concern. Luther was a political and religious radical, while Erasmus seemed willing to adapt to the political situation. Erasmus attempted to educate individuals through rational criticism, while Luther desired an aggressive revolution. Enchiridion Militis Christiani, the Handbook of the Christian Soldier (1503) outlined the views on Christian life which Erasmus was to spend the rest of his days in elaborating. He identified the chief evil as formalism, a respect for traditions without consideration for the true teaching of Christ. The remedy was for every man to ask himself at each point, “what is the essential thing?” and to do this without fear. In his examination of the dangers of formalism, Erasmus discussed monasticism, saint-worship, war, the spirit of class, and the foibles of "society." The Enchiridion was more of a sermon than a satire. Its companion piece, the Institutio Principis Christiani (Basel, 1516), was written as advice to the young king Charles of Spain, later Charles V, Holy Roman Emperor. Erasmus applied the general principles of honor and sincerity to the special functions of the Prince, whom he represents throughout as the servant of the people. Although Enchiridion Militis Christiani (Handbook of the Christian Soldier), was first published in 1503, and then reprinted in 1509, its real impact dated from its third printing in 1515. It went through twenty-three editions in the next six years. Its appeal was to educated lay men and women, and its acceptance marked a radical alteration in their self-perception. The Enchiridion suggested that the church could be renewed and reformed by a collective return to the writings of the fathers and Scripture. Erasmus conceived of Enchiridion as a lay person’s guide to Scripture, a simple yet learned exposition of the “philosophy of Christ.” Though the New Testament contained the lex Christi (the law of Christ), which Christians were called to obey, and which was a form of practical morality, teaching its readers to love goodness and reject evil, and to follow the example of Christ. Erasmus suggested further that reading the Scriptures could awaken an “inner religion” which would transform Christians and give them a new motivation to love God and their fellow men. Though Erasmus was not a Protestant, Enchiridion promoted several themes which were characteristic of the Reformation. Erasmus recognized that the future vitality of Christianity rested in the hands of lay people, not the clergy. His strong emphasis on the “inner religion” resulted in an understanding of Christianity practiced without reference to the church. Erasmus’ extraordinary popularity has been demonstrated by the number of editions and translations of his books that have appeared since the sixteenth century, and in the continuing interest excited by his elusive but fascinating personality. Ten columns of the catalogue of the British Library are taken up with the bare enumeration of Erasmus’ works and their subsequent reprints. The greatest names of the classical and patristic Among the classical and patristic writers translated, edited or annotated by Erasmus, are Ambrose, Aristotle, Augustine, Basil, Saint John Chrysostom, Cicero, and Jerome. The Greek/Latin edition of the New Testament, which Erasmus published in 1516, served as the basis for Martin Luther’s translation of the New Testament into German, and William Tyndale’s translation into English in 1526. In his home town of Rotterdam, the Erasmus Universiteit has been named in his honor. 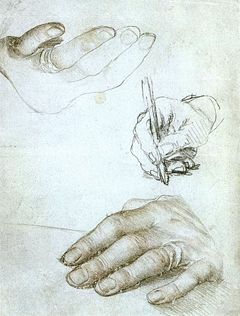 The portraitist Hans Holbein the Younger made a profile half-length portrait in 1523, and Albrecht Dürer made an engraving of Erasmus in 1526. Chantraine, Georges. Philosophie erasmienne et théologie lutérienne. Brussels: Duculot, 1971. Works by Erasmus. Project Gutenberg. A Merry Dialogue Declaringe the Properties of Shrowde Shrews and Honest Wives, available for free via Project Gutenberg. Colloquies of Erasmus, Volume I., available for free via Project Gutenberg. The Praise of Folly, available for free via Project Gutenberg. Selections from Erasmus Principally from his Epistles, available for free via Project Gutenberg.